At Butcher’s Pet Care, we believe dogs will enjoy their dinner so much more when they are served one of our tasty meaty meals. We guarantee to get them licking their lips. Why? Because every dinnertime, you’ll be giving your dog a delicious meal made with fresh meat and no artificial flavourings. Each delicious Butcher's meal has been developed with leading nutritionists so you can be sure your dog is getting all of the meaty proteins, vitamins and minerals they need to be as Fit as a Butcher’s Dog™. What’s more, there are no artificial flavourings and no fillers such as soya or wheat, so they are gluten free too. A tasty bowl of Butcher’s is made with natural ingredients and has everything that your dog needs and nothing it doesn’t! Butcher’s offers a range of more natural dog food in a can or a foil tray in a variety of delicious recipes. Packed full of all of the vitamins and essential nutrients your dog needs, Butcher’s can be fed on its own as a main meal or to add natural meaty taste to a dry food. All of Butcher’s delicious dinners are 100% complete so dog owners can be sure every dish includes everything your dog needs to keep him happy and healthy. The Butcher’s team will select 100 lucky participants and deliver a 10-day supply of free food to the dogs who have been invited to take part. 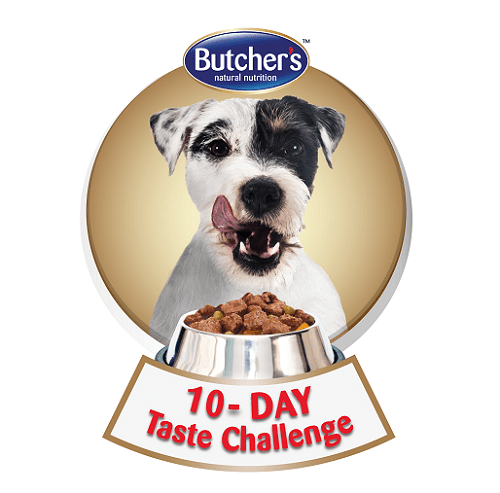 The owners will then be asked to share how their dog reacts to tasting the delicious meaty dinners from Butcher’s during the 10-Day Taste Challenge.